The Contra Costa Sheriff's drone appears to be a DJI Inspire. Federal officials have alleged that DJI is helping China spy on U.S. law enforcement and critical infrastructure. 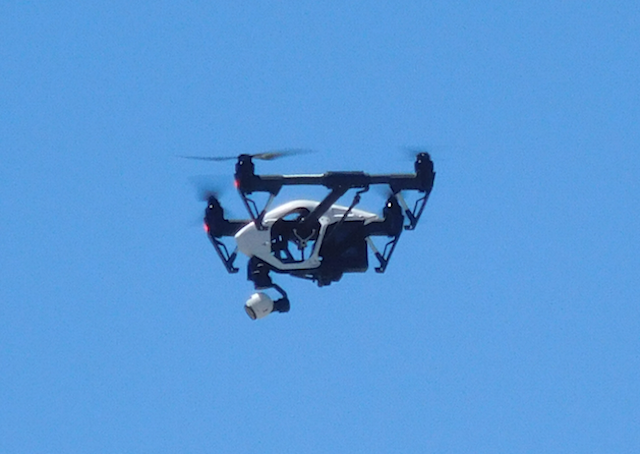 Hovering in the sky above an immigrant rights rally at the Contra Costa West County Detention Facility in Richmond last Saturday was a unmanned aerial vehicle, more commonly known as a "drone." The drone appeared to be video recording demonstrators who converged on the jail as part of a national day of protest against the Trump administration's immigration policies. The Contra Costa Sheriff holds immigrant detainees at the jail under a contract with ICE. After the protest ended, questions were raised about who was piloting the drone. Today, the sheriff's department confirmed it was their device. "The protest was held directly on the grounds of a secure jail facility with a capacity of over one thousand inmates," Contra Costa Sheriff David Livingston explained in an email sent to the Express today. "We also have perimeter patrols, video surveillance and other security measures designed to keep staff, visitors and inmates safe. A drone video platform augments those security measures and will be used in the future when necessary." Ironically, the drone appears to be a model that's manufactured by a company accused of spying on U.S. police agencies and corporations, and providing this data to the Chinese government. According to a confidential ICE bulletin that was made public last year, drones manufactured by the company DJI are uploading data to cloud storage systems based in China, Taiwan, and Hong Kong. According to ICE, "a foreign government with access to this information could easily coordinate physical or cyber attacks against critical sites." The bulletin's author stated that it's "most likely" that the Chinese government has access to this data. DJI, according to the ICE bulletin, has cultivated law enforcement customers by attending police trade shows throughout the U.S., and the company has been assisted in penetrating the American market with subsidies from the Chinese government. ICE has since declined to comment on the bulletin or release any more information to substantiate its claims. Meanwhile, DJI has adamantly denied the allegations. The company wrote in a post on its website last November that the bulletin contains "clearly false and misleading claims." According to DJI, the company's products do not capture and share sensitive data such as flight logs, photos, and videos "unless customers actively upload and share them with us," and this data isn't stored in servers accessible to the Chinese state. ICE isn't the only federal agency to warn that DJI drones could be leaking sensitive information. Also last year, the Army issued a memo calling on its own units to stop using DJI products because of "threat and user vulnerabilities" that might allow third parties to intercept data from the devices. The website sUAS News first reported on the Army's ban. When asked whether they still stand behind the allegations in the bulletin, ICE told the Express they still can't comment. The Contra Costa Sheriff's Office has three drones, according to its Air Support Unit website. The sheriff's department established its UAS team in 2016, the year before the ICE bulletin was written. Some think the ICE memo is a wild conspiracy theory straight from the Trump administration's imagination, and more recently, a third-party forensic analysis of the company's drones appeared to rebut many of the claims made in the ICE bulletin.